By esiegel on September 17, 2017. Well, another week of science has gone by, here at?Starts With A Bang! ?and everywhere else in the world, and while we're down one space mission from the start of the week (Cassini), there are still lots of good things on the horizon! We're just four weeks away from the official release of?Treknology, and just a single week away from the new Star Trek series, Discovery, which I'll be officially reviewing on Forbes. Our?Patreon supporters?are continuing to make amazing things possible, as not only are we doing podcasts and producing all we're producing, but we're going to start taking a new stab at a video miniseries, called (tentatively) FantaSci, about the science behind fantasy and sci-fi tropes, worlds, concepts, and technologies. Have a suggestion? Let's hear it! 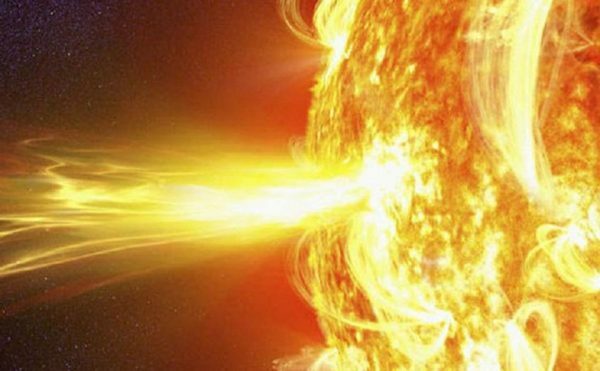 Proof of ‘God playing dice with the Universe’ found in the Sun’s interior. That's not a bad week, and as always, you've had quite the diversity of opinions to share. Let's check it out on?our?comments of the week! 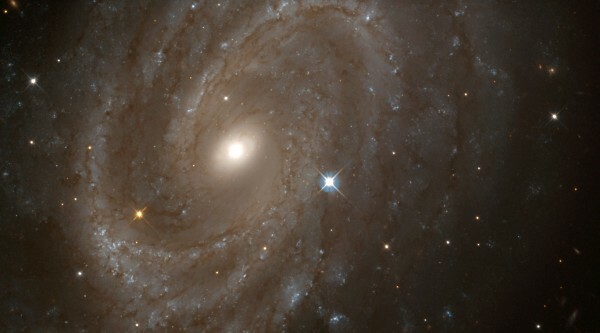 A NASA/ESA Hubble Space Telescope (HST) view of the magnificent spiral galaxy NGC 4603, the most distant galaxy in which a special class of pulsating stars called Cepheid variables have been found. Image credit: Jeffrey Newman (Univ. of California at Berkeley) and NASA/ESA. From eric?on the difference between explaining and describing: "We do science to gain information, and then we use that information to do other things; accomplish human social or policy goals. Are there any activities that can be accomplished by ‘explain’ science that can’t be accomplished by ‘describe’ science? Is mere ‘describe science’ unable to cure cancer? Launch satellites?" I think there is a difference, but I think the examples you note are all carefully chosen to be specifically where the difference is obscured. The difference, to me, in the context of actual problem-solving, is that when you can explain something, you understand the intricacies of how it works so well that when you're in a somewhat different situation, you can accurately predict what's going to occur. For a description, you can't. It's sort of like the difference between a physical theory of how galaxies rotate (a halo of dark matter distributed around baryonic matter), versus an empirical correlation regarding the relationship between two quantities (e.g., the Tully-Fisher relation). They can both accurately describe the relationship between a galaxy's luminosity and its velocity dispersion, but only the explanation can allow you to understand other types, morphologies, and classifications of galaxies. A description is enough to accurately describe the behavior of a particular class of systems; an explanation covers more ground than that. 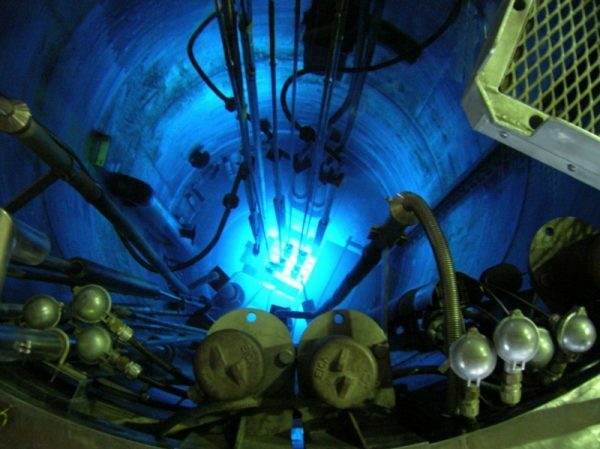 Uranium ore contains less than 1% U-235, and must be processed into reactor-grade uranium. 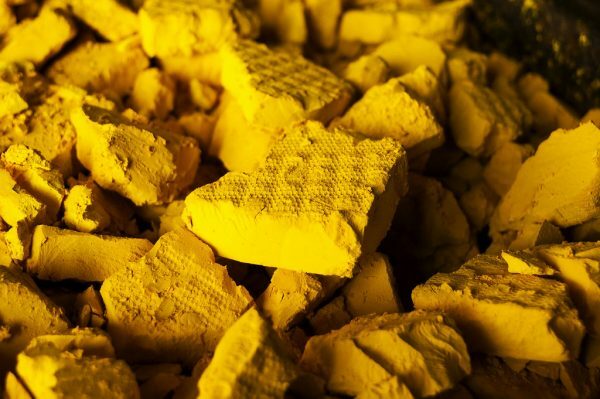 A photo of yellow cake uranium, a solid form of uranium oxide produced from uranium ore. Yellow cake must be processed further to become reactor-grade. which is 3-5% U-235. Weapons-grade requires approximately 90% U-235. Image credit: Nuclear Regulatory Commission / US Government. From John?on the true nuclear fear: "A related concern that terrorists can use to spread the FUD they exploit is to add radiation sources (non-weapons grade) to a conventional explosive bomb to make areas unsuitable for people to live." I mean, a nuclear weapon in the hands of a single bad actor is one of the worst-case scenarios imaginable. A nuclear device going off in a heavily populated area could kill millions or even tens of millions, cause many trillions of dollars worth of damage, and could contaminate water, air, and land in places for decades or centuries. A single dirty, nuclear bomb has truly horrific potential. “As of 2016, countries including Australia, Austria, Denmark, Greece, Ireland, Italy, Latvia, Liechtenstein, Luxembourg, Malaysia, Malta, New Zealand, Norway, Philippines, and Portugal have no nuclear power stations and remain opposed to nuclear power. Belgium, Germany, Spain and Switzerland are phasing-out nuclear power. Globally, more nuclear power reactors have closed than opened in recent years but overall capacity has increased.”"
There is still a lot of NIMBY fears about nuclear, but until we have either nuclear fusion or high-capacity renewables that can meet humanity's energy needs, our options are either nuclear power or fossil fuels. While there are a few developed nations that are choosing a combination of renewables and (mostly) fossil fuels, the decision to eschew nuclear for fossil fuels is a losing choice for the environment in the long-term, and does nothing to ameliorate the growth of nuclear among developing nations. I read your Wikipedia article that you quoted, and I think the phase-out is not as dominant a trend as you want it to be. 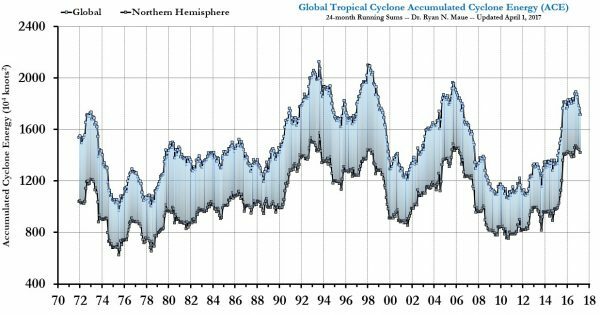 Accumulated cyclone energy over a nearly 50 year time period, globally. Image credit: Ryan Maue. From William Later on whether there are significant trends in tropical storms: "Such a clear cut increasing trend. The graph you've presented shows two things: a very noisy effect (there's more than a factor of 2 in variation between the lightest years and the heaviest), and a slight upward trend with a large uncertainty. That, by the way, is what the climate models predict, and why NOAA makes careful statements to say that we cannot yet robustly detect the slight upward trend, although all the physics at play shows it must exist and the data is consistent with that to within the uncertainties. But the point about tropical storm strength that I made in the article?wasn't that the overall accumulated energy was increasing, even though it should be. The point also wasn't that this is the worst year ever, or that every year will be a bad year, or that this hurricane season is a direct result of global warming. But in?the wake of Hurricane Harvey?we?can now see?what?climate change?is really about. It was never about clever arguments but, instead, something much more elemental: power, money and human suffering. We know how climate change affects hurricanes. We know what the cost of doing nothing is. It's long past time to act, but acting now is still vital. I've been saying this for a long time and will likely keep saying it until we do something about it. Which may not happen in my lifetime, but you've gotta try. 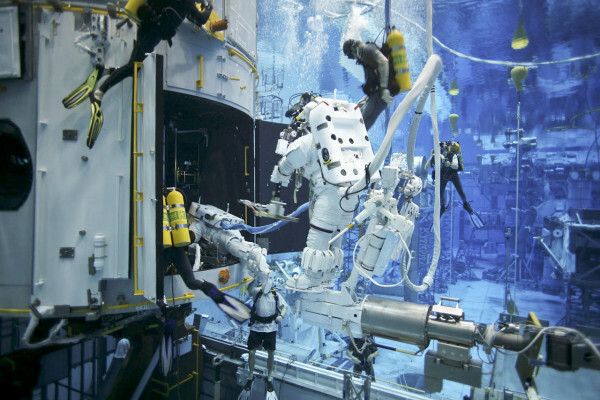 This image shows Hubble servicing Mission 4 astronauts practice on a Hubble model underwater at the Neutral Buoyancy Lab in Houston under the watchful eyes of NASA engineers and safety divers. Image credit: NASA. From Sinisa Lazarek on the tech of deep-space missions: "when it comes to technology evolution and time it takes for probes to get to outer planets, we’ll sadly always lag behind. Meaning, what was cutting edge when the probe was made, will always be retro tech by the time it arrives to the destination." This is absolutely true, and it's why the ability to service a space telescope like Hubble was such an incredible boon to science. Think about the images Hubble took in 1995, after the first servicing mission. You know, images like the original Hubble Deep Field. 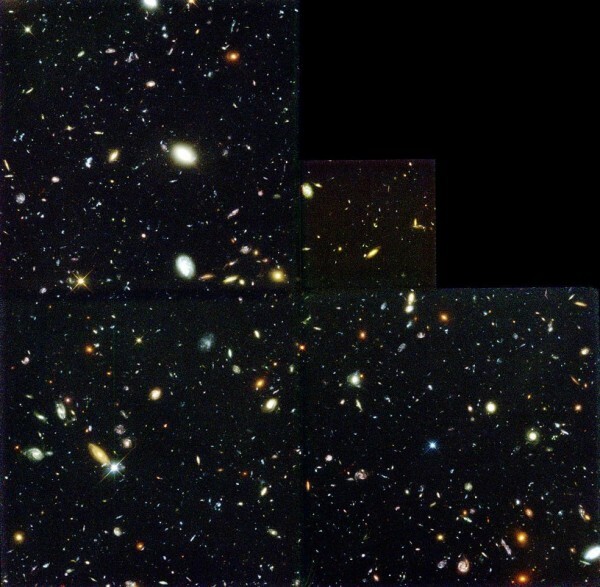 The original Hubble Deep Field, which discovered thousands of new galaxies in the abyss of deep space. Image credit: R. Williams (STScI), the Hubble Deep Field Team and NASA. Now think about what it took with its upgraded cameras more than ten years later. Same optics, mind you, same mirror, same light-gathering power, and almost the same amount of observing time. Yet that better camera technology and computational power sure did make a difference! 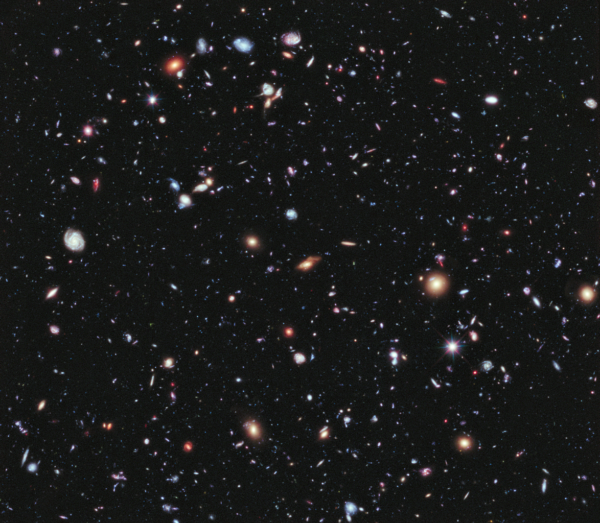 The Hubble eXtreme Deep Field (XDF), the deepest view of the distant Universe ever taken. Image credit: NASA; ESA; G. Illingworth, D. Magee, and P. Oesch, University of California, Santa Cruz; R. Bouwens, Leiden University; and the HUDF09 Team. We're talking about three times as many galaxies, greater detail, broader wavelength coverage, deeper redshifts, fainter objects, and much more. We are entering an era where we're going to be launching a large number of missions and observatories to the L2 Lagrange point, some 1.5 million kilometers from Earth. The only observatories we've ever serviced were less than 1,000 kilometers from our world. If we want to service James Webb, or WFIRST, or any other future missions, we have to develop the capability of not only getting there, but to either get humans there (some four times as far away as any human has ever gone in space) or to program robots with sufficient precision that they can do the servicing automatically. When you're sending something out into deep space, you're stuck with the launch-era technology, but when you're close to home, you can always make it better if you're willing to invest in doing so. 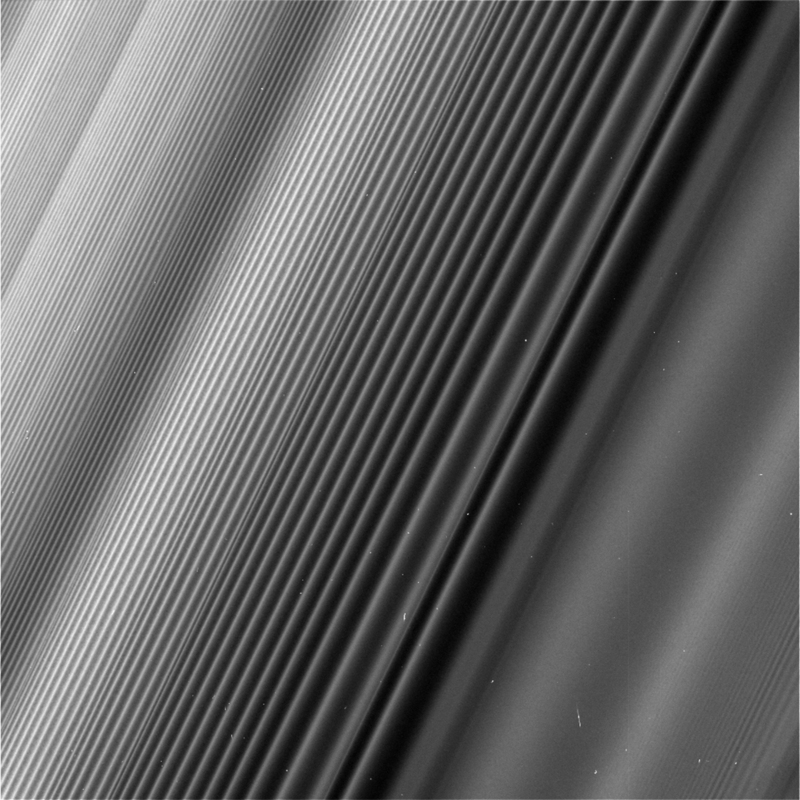 The ripples in Saturn's rings as seen up close from Cassini. Image credit: NASA/JPL/Space Science Institute. What appears to be a vast number of evenly spaced rings are not individual rings at all. The process that makes this ring appear as it does is the same process that forms the structure in spiral galaxies. The entire ring is a 2 arm spiral wound around and around and around so every other band is just another section of the same continuous spiral arm." This is truly incredible, and you can see the density waves bunching up the farther out you go. If you look closely at the lower right of this image, you can also see some vertical ripples which are evidence of a bending wave, which are caused by yet another of Saturn's moons. Those points of light you see? Those are background stars, seen through the diffuse ice-particles that make up Saturn's rings. (Which are 99.9% ice, by the way!) Cassini has taught us some truly incredible things, and as is always the case, it's brought up even more questions that need answering. My favorite image set from the finale, if you were curious? A timelapse of Saturn's evolving ring structure. Image credit: NASA/JPL/Space Science Institute. This incredible showcase of how Saturn's ring structure isn't static, but rather evolves over time. We think of things like orbiting planets and moons and fool ourselves with this vision of the Solar System as unchanging over even long periods of time, but the changes in the rings of Saturn have shown us how naive we truly are when it comes to that point of view. With the exception of a few major static features, normally related to the locations of large moons, Saturn's rings are ever-evolving. And the view is fascinating. 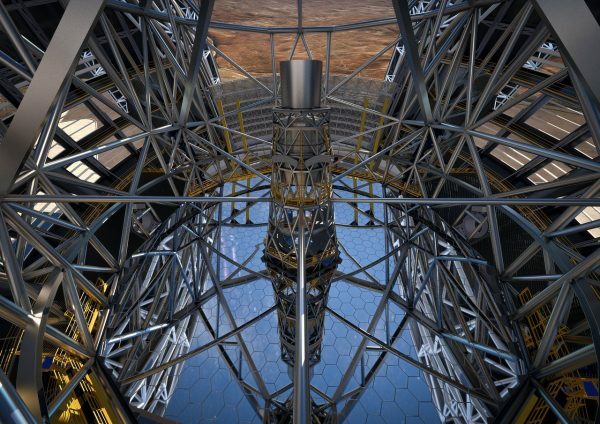 The construction design for the ELT, revealed in 2016, was the basis for this artist's rendition of what the completed telescope, with the dome open, will look like in approximately 7 years. Image credit: ESO/L. Cal?ada/ACe Consortium. How about dust from air? I think it should be possible to keep away dust by creating a (negative?) static electric field all around the telescope." I know it's not as impressive as creating a giant static field, but this is part of why it's so important to have that final coating on the telescope mirror. It's not like the mirror needs to be polished; that 7.5 nanometer tolerance is good from the moment the mirror comes off the rack. But the coating is what's so important, both for an additional level of reflectivity and to keep the mirror as pristine as possible. When it does get dusty, that's degradation at work. The only better option? To go to the most dust-free environment we know of: space. But that's a little bit pricier, and a little less accessible for servicing. The power spectrum of the fluctuations in the CMB are best fit by a single, unique curve. 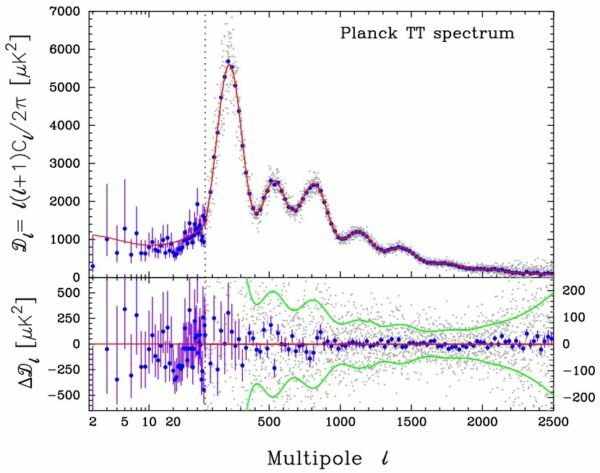 Image credit: Planck Collaboration: P. A. R. Ade et al., 2014, A&A. From Denier?arguing against the usefulness of theoretical work in science: "
By your thinking, can anything ever be proven wrong? As a whole, I think historical observation is far more useful than scientific theory at predicting the future. When cavemen didn’t know what the sun was or that the Earth wasn’t flat, they still knew the sun would come up in the morning." First off, yes, theories can be demonstrated to be wrong. "Proven" is the wrong word if we're being pedantic, because you can always tweak your theory or your model to try and fit the observations a little bit better. Sometimes this is a useful approach! We warn laypeople about "throwing out the baby with the bathwater" or advise them to "chew on the meat and throw away the bones" because quite often, there's a seed of a brilliant idea embedded in an overall model, theory, or idea that doesn't pan out. Copernicus' theory didn't work; it was less successful than Ptolemy's. What do you do? Tweak it and work with it, or abandon it? The Big Bang didn't accurately predict the large-scale structure of the Universe, even with the right seed fluctuations. Do you throw it all away? Or do you find the one modification -- dark matter -- that not only makes it work, but that fixes a whole host of other problems? What you are describing as "historical observation" is very closely related to the "descriptive" approach to the Universe we were talking about to start off this edition of our comments. Sure, you can use past experience to predict future behavior. But only if you have a successful theory can you do it, you know, in a quantitatively accurate fashion. That's the difference between a weather forecast and the farmer's almanac, or a meteorological projection and a groundhog. If you want to be intellectually lazy, relying wholly on historical observations will get you pretty far most of the time. But we can go farther. Let's all go together! At the photosphere, we can observe the properties, elements, and spectral features present at the outermost layers of the Sun. But it's the processes taking place in the core that provide its true power. Image credit: NASA’s Solar Dynamics Observatory / GSFC. And I'll give the last word this week to Frank?on the subject of God playing dice with the Universe: "Hidden variable theory seems like a valid counter argument against entanglement at first (like Einstein thought) but if it was true then quantum computers would not work (however we have primitive but working examples of them today)." There are two things at play that felt "spooky" to Einstein in quantum physics: the notion that nature would be inherently probabilistic rather than deterministic, and that two objects would affect each other in a faster-than-light fashion. The first one is "determinism" and the second one is "locality" (or non-locality). Hidden variables was a way to try and save both; to say that you can have a deterministic Universe where everything was locally connected, by having some behind-the-scenes variables that are responsible for what we perceive as the quantum nature of the Universe. But that doesn't work for a variety of reasons that have been demonstrated over the past 55 years or so. And the interior of the Sun is a perfect example; without quantum physics, the Sun wouldn't shine at all! What's remarkable about our theories isn't how intuitive or simple they are, but how well they describe the Universe that we inhabit. How successful their quantitative predictions are, and what a wide range of phenomena they apply to. There's nothing else in the Universe quite like the fundamental laws of physics, and perhaps that's what it was that made me fall in love with the subject all those years ago. It's a love that countless others have shared throughout history, and that many will continue to share for generations to come. You're always welcome to share in it with me, and hopefully there will be even more to come in the days, weeks, months and years ahead. See you there! "I read your Wikipedia article that you quoted, and I think the phase-out is not as dominant a trend as you want it to be. Me personally, I don't have a particular preference on this topic. The debate about phase-out just pops up on a regular basis where I live. My curiosity with nuclear is more further down the line, at the next level, if Protons 'can' be converted into energy. We know what the cost of doing nothing is. First, I find it quite funny you would make that a hyperlink to an article that doesn’t detail the cost. I’ve linked to actual economic studies and can’t get you to read beyond the title, but I don’t want to detract from what I believe is a massively important point I feel you are missing. In 1935 there was a hurricane that followed almost the exact same path Irma just did. When it hit the Florida Keys it was recorded as an 892 mbar low. It killed everyone. By comparison hurricane Irma even at the most violent stretch as a Category 5 storm out over the Atlantic never got below 913 mbar. I’m not trying to use anecdotal events to disprove trends but rather I’m pointing out even if we could drop atmospheric carbon to 1935 levels, and we can’t, it guarantees us nothing. There are records of hurricanes and typhoons as far back as there is history. There is no amount of carbon emission reduction that would make us hurricane proof or can even be counted on to meaningfully lessen the power of hurricanes. Hurricanes are going to happen no matter what we do, but Irma is perhaps the perfect case in point on the impact of economics. The Category 4 eye wall rolled right across Key West and they’re mostly fine. It came through in the early morning and by that night there were even a couple of bars on the island that opened. There is money in Key West and the structures are well built. 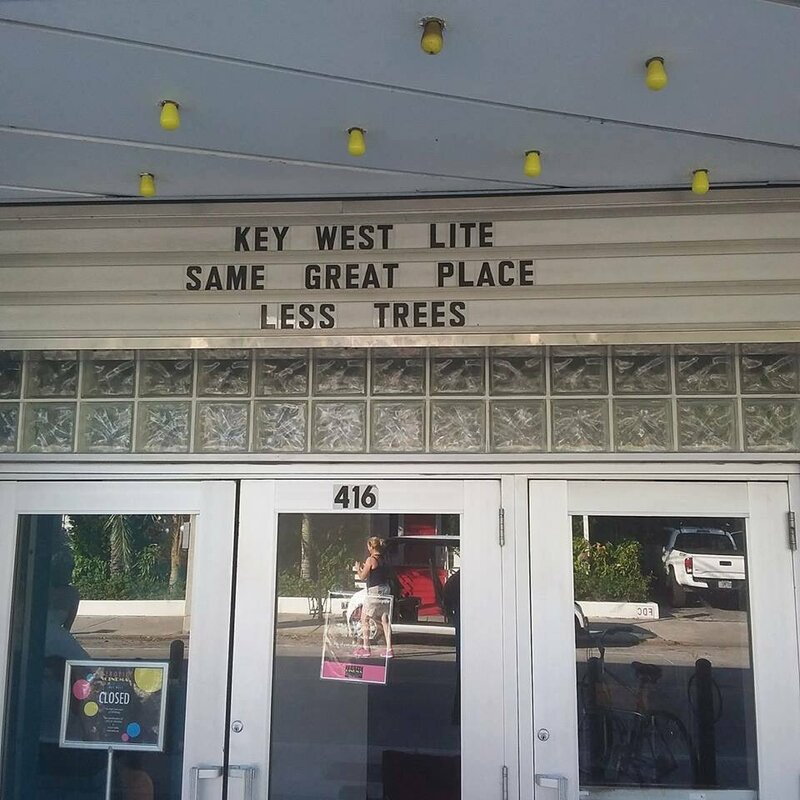 There are keys that don’t have Key West’s wealth. On those Keys there are mobile home parks and unrenovated houses built before the 1986+ building codes were enacted. They didn’t fare so well. It wasn’t uncommon to see a newer looking home appear as if nothing happened sitting across the street from a scene of utter devastation. Down in the Caribbean there is even less wealth and many of those islands look like they were hit by an atomic bomb. No amount of carbon reduction will make any difference, but increasing wealth does and the difference it makes is massive. I understand that you want to save the environment and your motives are only the best, but if you implement a policy that reduces carbon at the expense of economic growth you can get people killed for what would be no appreciable gain. If you want to help, and I mean really help, then help economically. Both the people and the environment will benefit. Denier, that was VERY WELL articulated. It was well reasoned and articulated in a thoughtful, non condescending/argumentative tone that should evoke open dialog, thoughts in a constructive atmosphere. You set a fine and decent example for how modern scientific/political/social discourse rebuttals with regards to the current events of the day should be handled. "The point was that human activities are affecting the planet in a negative way, that these effects are quantifiable"..
and then you don't mention those 'effects' are in fact not very quantified at all. NOAA even says so. "… It is premature to conclude that human activities–and particularly greenhouse gas emissions that cause global warming–have already had a detectable impact on Atlantic hurricane or global tropical cyclone activity. That said, human activities may have already caused changes that are not yet detectable due to the small magnitude of the changes or observational limitations, or are not yet confidently modeled (e.g., aerosol effects on regional climate). …"
"But statistical tests reveal that this trend is so small, relative to the variability in the series, that it is not significantly distinguishable from zero (Figure 2). In addition, Landsea et al. (2010) note that the rising trend in Atlantic tropical storm counts is almost entirely due to increases in short-duration (<2 day) storms alone. Such short-lived storms were particularly likely to have been overlooked in the earlier parts of the record, as they would have had less opportunity for chance encounters with ship traffic." Funny, they want to put in the caveat "That said, human activities may..." which is just English 101 weasel words for "I have no actual data." I am not impressed with your claims of certainty Ethan, because even the 'experts' who would love to back your convictions, can't.